The Memento Smart Frame 25" is the world's most advanced 4K digital picture frame. 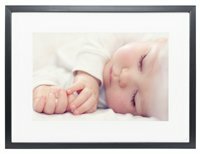 Every day, it will connect you to your most precious memories by displaying your digital pictures with the highest quality possible. You'll appreciate its design, impressive resolution and ease of use. With the Memento Smart Frame, you can upload all of your pictures to Memento's internal memory storage using your smartphone, tablet or personal computer. What's more, thanks to the Memento App, which can be used on any Android device, iPhone, iPad, and Windows or Mac computer, you can set playlists to personalize your frame's slideshow.